Week 9 Reading Comprehension (E-9). A reading segment and questions about vascular tissue inside a plant’s organs. Cross-Curricular Focus: Life Science. 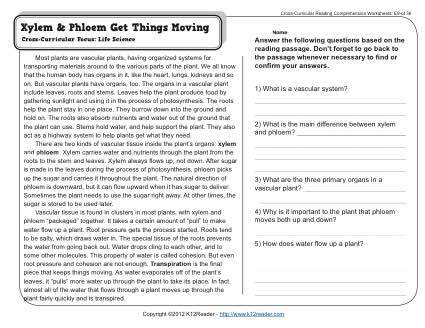 This worksheet is in line with Common Core Standards for 4th – 5th grade Key Ideas and Details, but may also be used for other grades. The passage’s Lexile Level is 850.